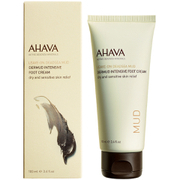 Treat dry, cracked feet to the AHAVA Mineral Foot Cream; a fast-absorbing, lightweight formula that utilises Dead Sea minerals to soften and repair skin, without leaving behind greasy residue. Harnessing the powers of Aloe Vera and Tea Tree Leaf Oil, the soothing cream delivers anti-bacterial and anti-fungal benefits, whilst a nourishing blend of Avocado, Sweet Almond and Jojoba Oils infuse feet with goodness, leaving them comforted and conditioned from heel to toe. 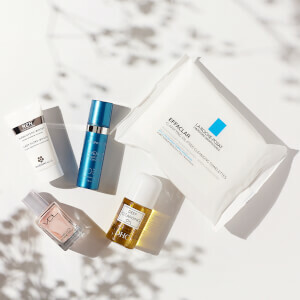 Aqua (Mineral Spring Water), Ethylhexyl Palmitate, Ceteareth-30 & Cetearyl Alcohol, Cetyl Alcohol, Glycerin, Sodium Cetearyl Sulfate, Oleyl Erucate, Dehydroacetic Acid & Benzoic Acid & Phenoxyethanol, Hamamelis Virginiana (Witch Hazel) Flower Water, Maris Sal (Dead Sea Water), Aloe Barbadensis Leaf Juice, Dimethicone, Parfum (Fragrance), Persea Gratissima (Avocado) Oil, Simmondsia Chinensis (Jojoba) Seed Oil, Prunus Amygdalus Dulcis (Sweet Almond) Oil, Triticum Vulgare(Wheat) Germ Oil, Allantoin, Salicylic Acid, Tetrasodium EDTA, Menthol, Arginine, Melaleuca Alternifolia (Tea Tree) Leaf Oil, Tocopherol (Vitamin E), Linalool, Citronnellol, Butylphenyl Methylpropional, Amyl Cinnamal, Coumarin, Alpha- Isomethyl Ionone, Limonene, Isoeugenol. I love this product! 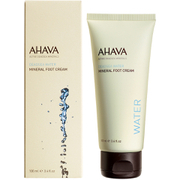 It absorbs instantly and leaves feet feeling smooth and moisturized without any greasy feel.